*with thanks to Dewey "Pigmeat" Markham and Sammy Davis Jr. I had the pleasure of serving as one of the judges for the Fanshawe College Fashion Merchandising Program's Wearable Art Fashion Show on March 27th. 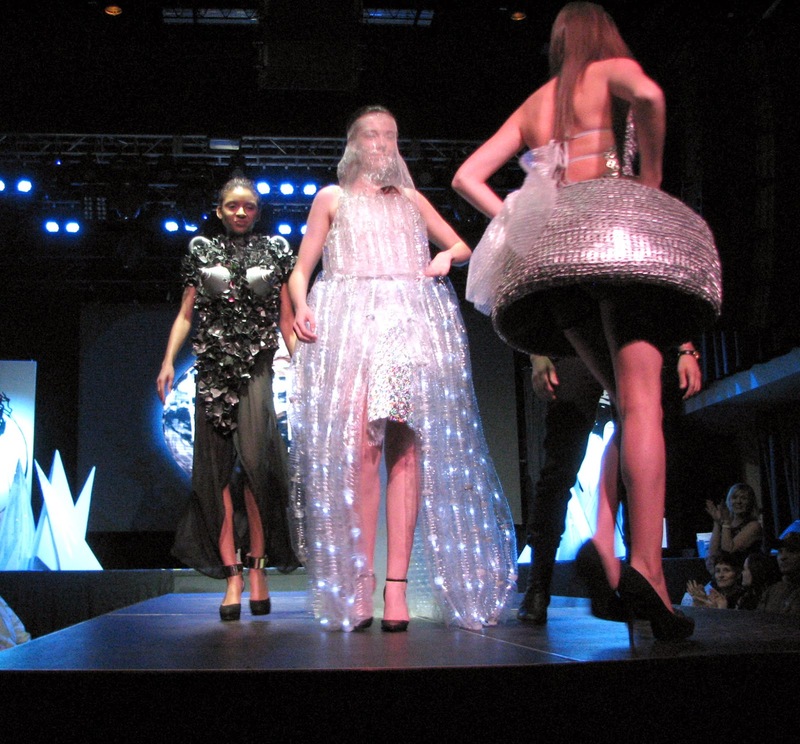 I had attended the show last year and was very impressed with the creativity shown by the first year Merchandising students who create the garments for the show using recyclable materials, so when I was asked if I could step in at the last minute as a "replacement judge" I readily agreed. 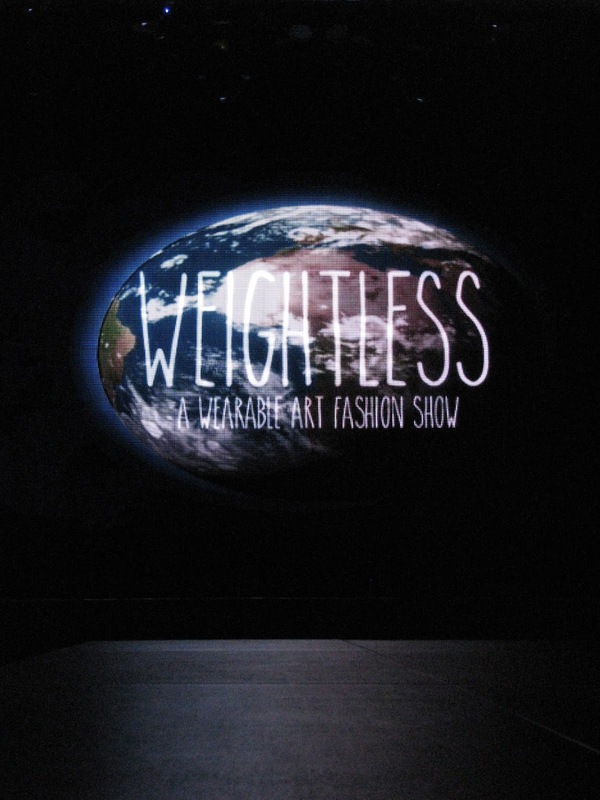 The theme of this year's show, titled "Weightless" was Outer Space. I expected to see a lot of silver and other reflective surfaces, and I was hoping for some weird alien/planets/sci-fi inspired outfits. There was a lot of the first, but not so much of the second. 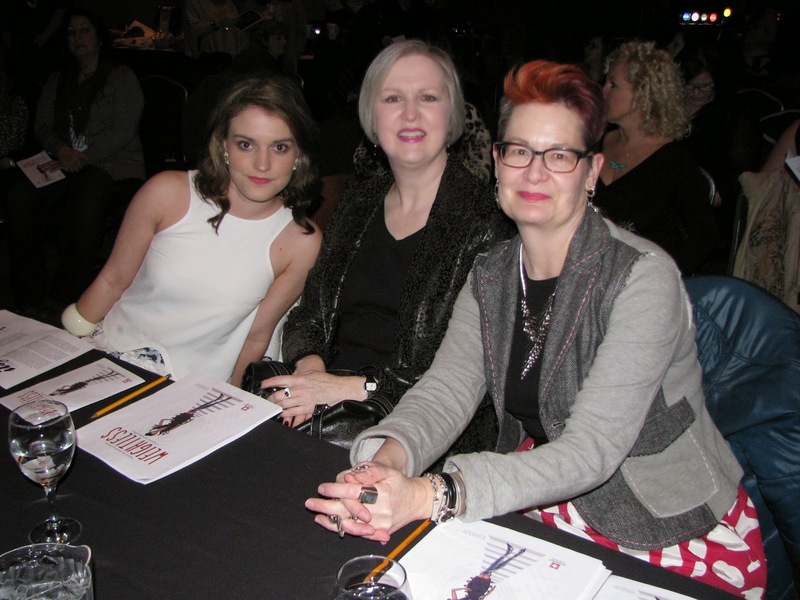 The Judges Table: (from left) Jennifer Lofthouse, a fashion blogger and graduate of the Fashion Merchandising program, Carol Toop, a retired long-time instructor in the Fashion Design Program at Fanshawe College, and yours truly. It was my first time acting as a judge at a fashion show where you have very little time to examine the clothing and assign a score before the next outfit is already on the runway. 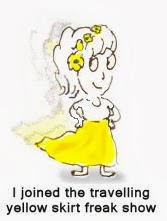 Fortunately, Carol was a veteran at this and providing some helpful hints. Designs were scored on three criteria: overall look/presentation, creativity, and workmanship/fabrication. As my judging duties took priority over blogging, I knew I wouldn't be able to take many photos during the show but I did manage to get a few of some of my favourite outfits. 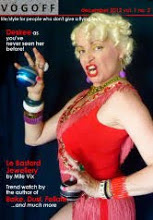 This was the first outfit that really grabbed me, designed by Claire Conway and Sarah Deme. 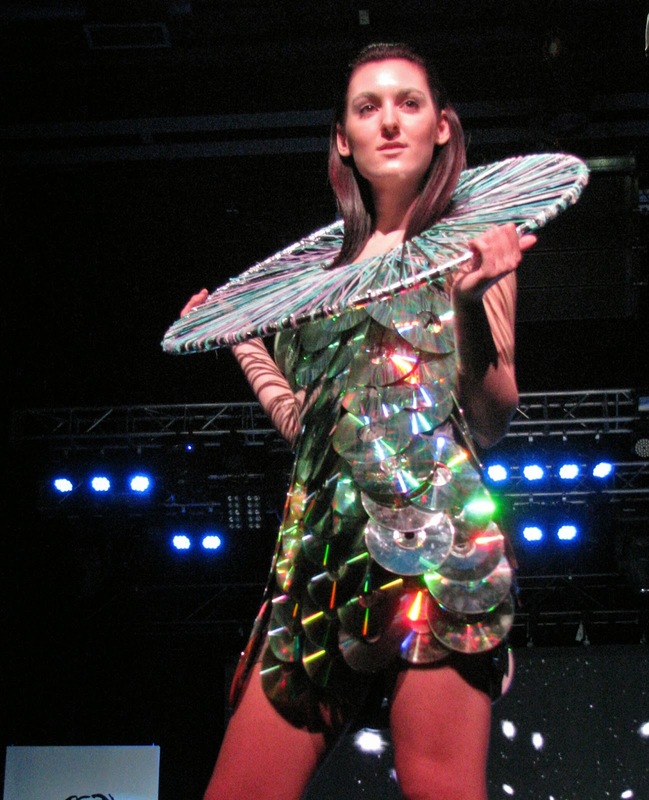 While other students had incorporated bubble wrap into their designs, this was the first one that had an other-worldly feel to it, and even though the shape wasn't particularly flattering to the model, it felt more like "Wearable Art" than some of the other designs. We awarded this one first prize. 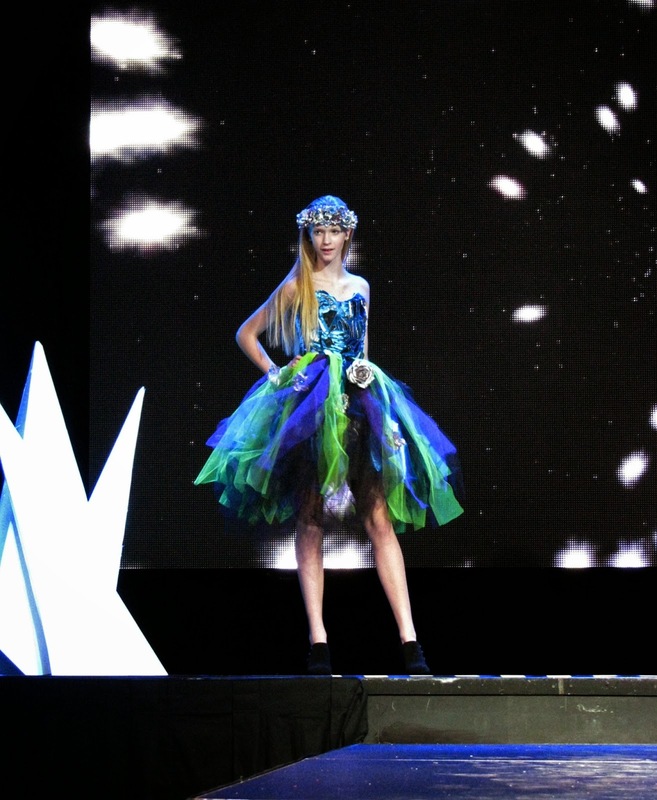 I liked the idea of this dress, designed by Jennifer Noun and Daniela Navas. I loved the giant metal neckpiece; it was one of the most interesting accessories in the show. 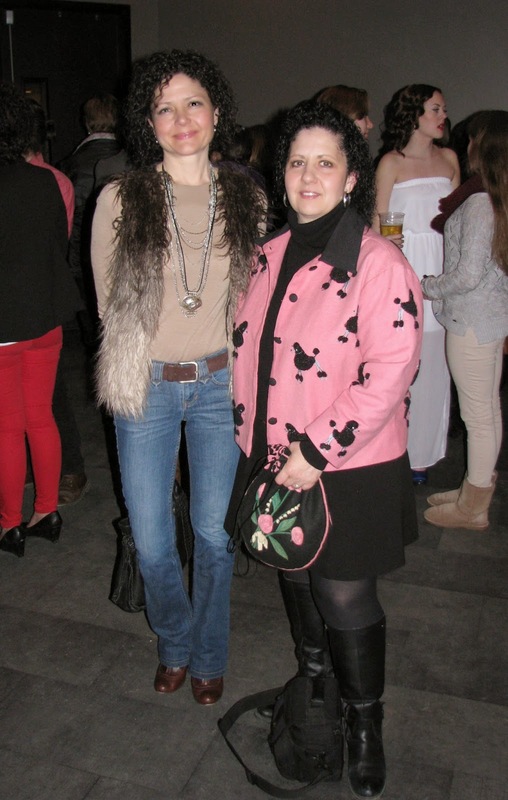 For the last several years, the proceeds from The Wearable Art Fashion Show have supported Itsy, an organization that assists parents of premature babies in the NICU at Children's Hospital in London. The funds help with the costs of accommodation, gas, food, baby supplies, etc. incurred by parents of the premature babies until they can bring their little one home. Several of the former "preemies" whose parents have been helped by Itsy take a turn on the runway during the show. I wasn't sure if they were supposed to be planets or pizzas, but they were adorable nonetheless. 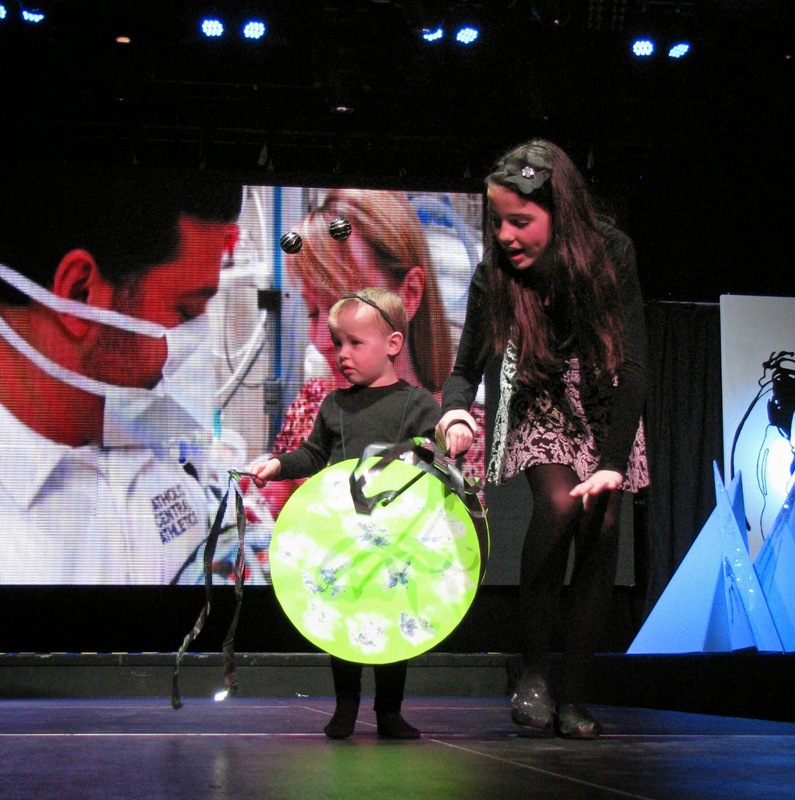 Images of life in the Neonatal Intensive Care Unit were projected on the screen at the rear of the stage while the little ones walked the runway, assisted by Grace Jenken. Some of them, like this little guy, were less impressed by the experience than others. The mix of materials used in this dress, including soft drink can pull tabs and melted and painted pieces of plastic water bottles, was very creative. 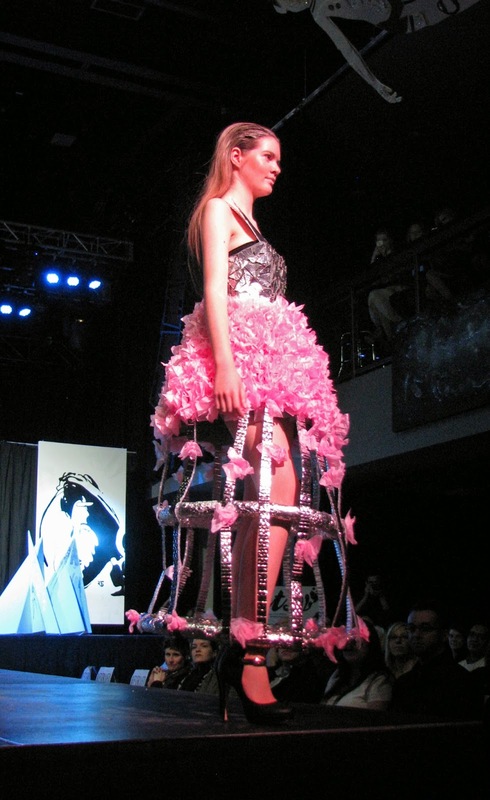 The dress was designed by Athena Rainville and Kelly Ranata. More silver, this time paired with pink tissue flowers in a design by Laura Gordon and Kelsey McGraw. The screen on the back wall was put to good use as the projections of space-related images added visual atmosphere to the show. 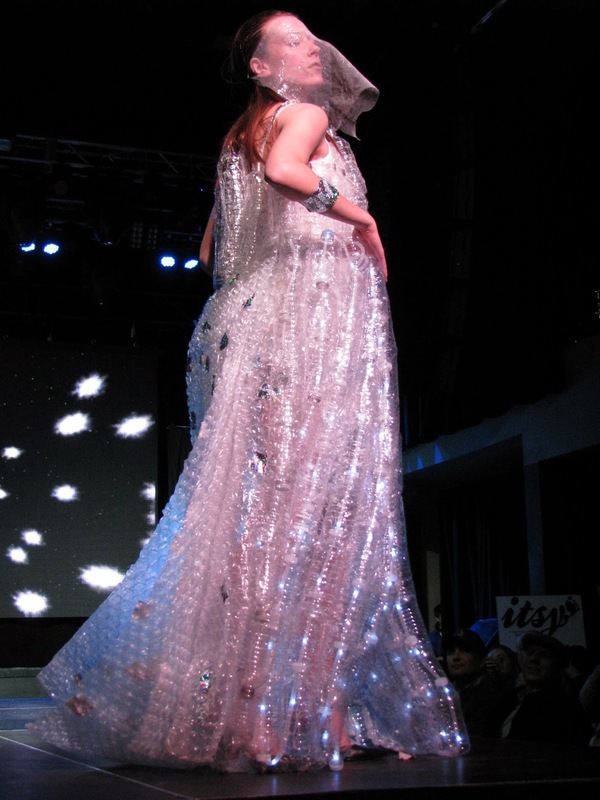 I thought this outfit, designed by Sydnie Blaskievich and Samantha Distefano, was very pretty but seemed more "fairy princess" than "outer space". This was also an example of a good outfit with the wrong shoes. The black heeled ankle boots worn by the model did nothing to enhance the dress. All the models wore shoes with very high heels and in most cases this detracted from, rather than added to, the overall presentation. Considering the theme, I thought combat boots, colourful converse, knee high boots with some "space" themed additions like foil or plastic shields, or even a colourful pair of heels, would have been much more effective. A few of the designers added headpieces which contributed to a more complete overall look, as opposed to just "a dress". 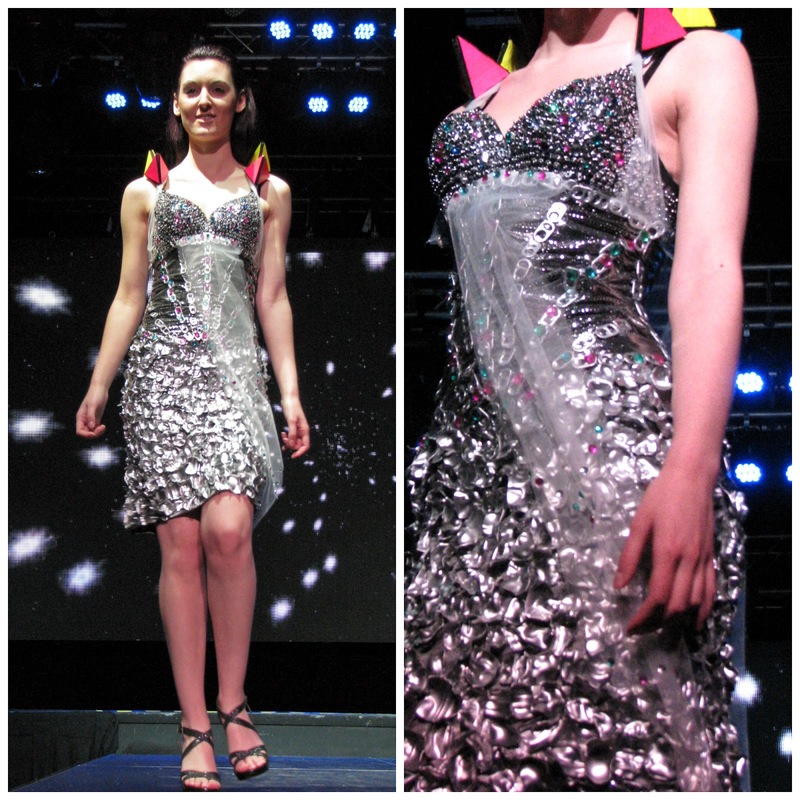 The structure and fit of this pop can tab dress designed by Gabrielle Gitman and Lorelei Newton was amazing, and earned them third prize. The headpiece added a cool space warrior vibe. There was some sparkle off the runway too. On my way out of the show I ran into Amber, of Jackpot Vintage (r), and her sister, each rocking their own distinct styles. 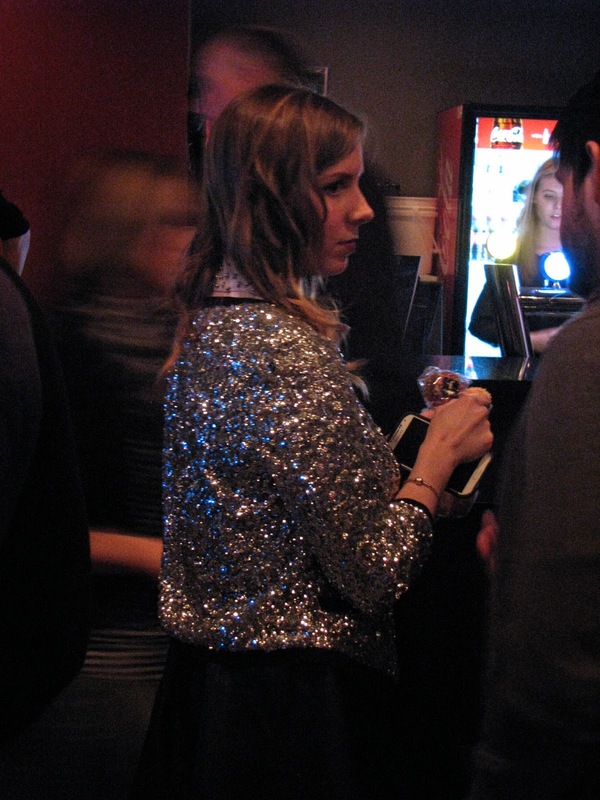 Amber found her funky poodle jacket at a Vintage show in Toronto last weekend. Thanks very much to Linda Jenken of the Fashion Merchandising Program for the opportunity to be a judge for the show. The students did a very professional job of organizing and presenting the show, and I enjoyed it tremendously. What a cool show, and such a great cause. And look at you, Da Judge! What a great experience. The soft drink can tab and water bottle dress is my fave, so pretty! I really like the pop tab dress! Look at you all judging away! Seems like a cool event. There is a similar fashion show here with the local arts college - you're so right on the shoes! They throw on these chunky black things that just don't go! How interesting to get to see all those creations, and to be invited to be a judge is so cool! You certainly look the part, Shelley - funky, stylish, individual and creative, just what the show is all about.